Switching from fauna to flora for this one. My friend, Jen, is an amazing woman with a remarkable new local business called the Elf Shelf. She makes custom gift basket arrangements, and delivers them with her son, Nick, a terrific young man with numerous disabilities and also the most amazing ability to make anyone smile. 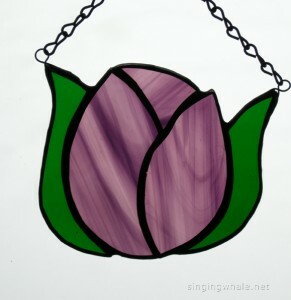 Jen loves tulips, and she’s just inspiring with how she brings so much energy to everything she does, so I decided to make her a stained glass tulip. I just wanted to do something very simple since I wasn’t sure what sort of window space she would have for a piece. I found a pattern on line with several tulips, and I downloaded that, making some edits and adjustments to create a single tulip bulb with a couple of leaves. 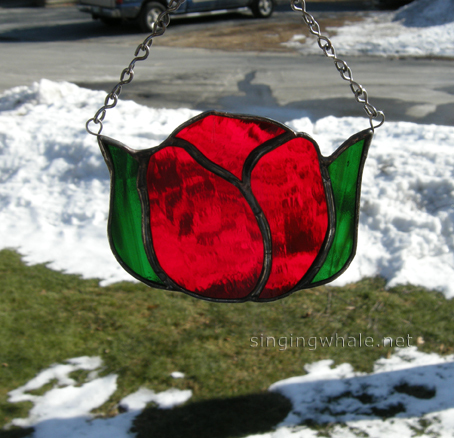 Used red waterglass for the tulip itself, black patina on the seams, and it turned out nicely. Luckily, Jen loved it! The more I looked at the tulip, though, the more I realized that, to me, a tulip has a longer, more tapered body. 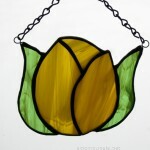 So off I went to find a good photo of a single tulip bulb, and then work that into a pattern. I still wanted to keep the finished pieces fairly simple and wound up doing two sizes, to see what would work best. 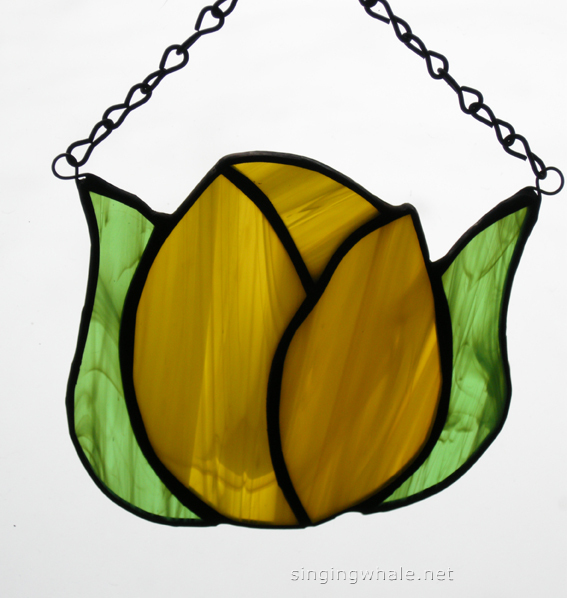 And because I don’t do anything without going whole hog, I made three samples in each size, with red, yellow and purple glass for the flowers, and various greens for the leaves. There’s a gallery of stained glass flowers works in progress now, as well, if you would like to see what I made. What do you think? Different colors, different sizes? 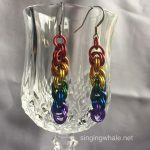 I think I am partial to the one with purple waterglass. What flowers should I try next? This entry was posted in new works and tagged flowers, tulips. Bookmark the permalink.